Recently noticed that ads are now popping up when viewing the forum on Tapatalk. If you click on the upper corner of the ad, the attached message shows up talking about revenue sharing. Is the AHA actually seeing $ from tapatalk? 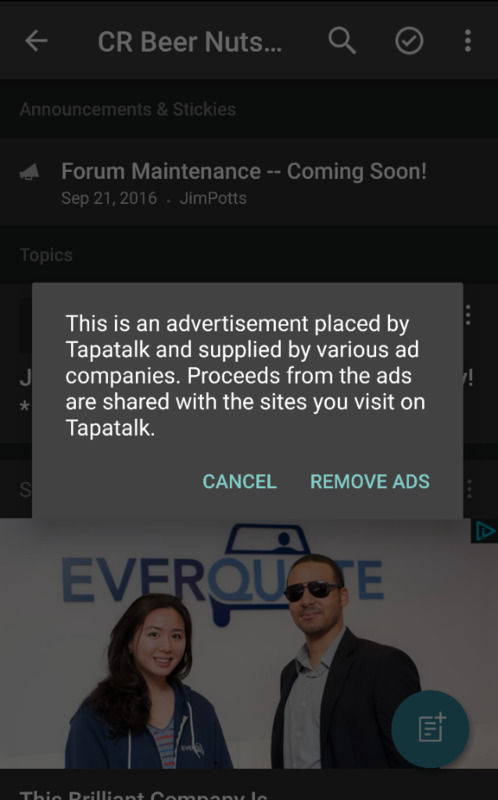 Note: I'm used to seeing ads on the tapatalk news feed, but this is now inline with forum topics. I thought the AHA paid the license to avoid the ads. Not impressed here. Did you see that ad on the app or via Tapatalk online? It looks like we may have had a mistake on our settings for the online version, which may have allowed ads to show up there. There definitely should not have been Tapatalk-placed ads in the mobile version. It is not our intention for Tapatalk to be placing ads on the AHA Forum. We should have this corrected, but please follow up if you continue to see these kinds of ads in the future. Thanks Gary. I saw the ad on the app. Just starting showing up in the last day or two, after the Tapatalk App updated. The AHA Forum isn't the only forms this is occurring on either, so might just be something on the Tapatalk side of things. Tapatalk has two revenue streams. Users and forum admins. Users can pay to his ads, and admins can pay to have their forum be ad free. Thanks! We've got a trouble ticket in with TapaTalk. This is definitely on their end.